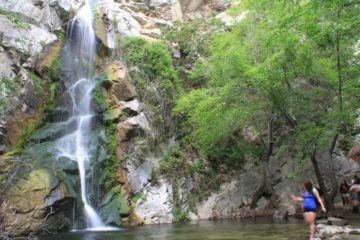 Bonita Falls was one of those waterfalls where you really had to look past its flaws (most of which were human-induced) in order to appreciate its true beauty and the fun experience to get to it. 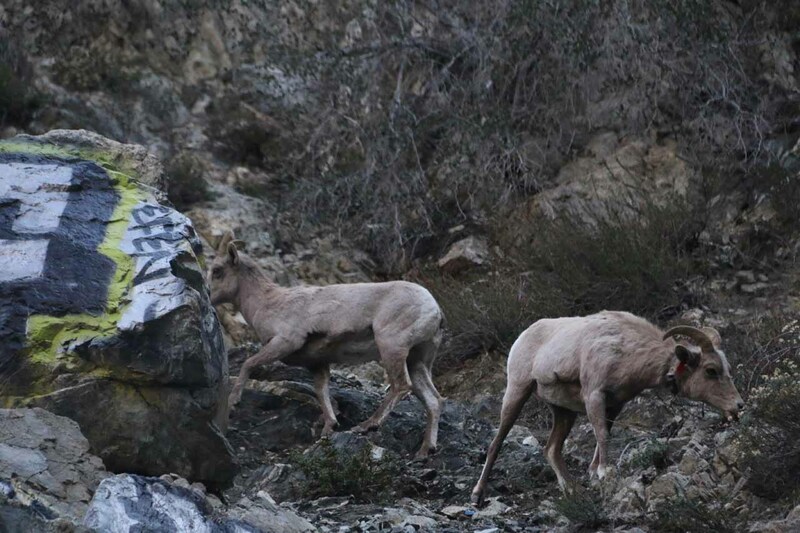 On one of our visits here, we even managed to get a surprise visit from bighorn sheep! 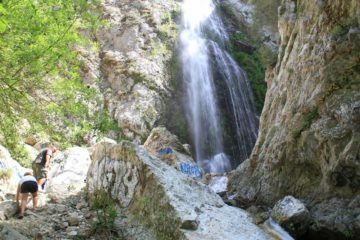 Indeed, we got to experience both the good and the bad and ugly with this falls. 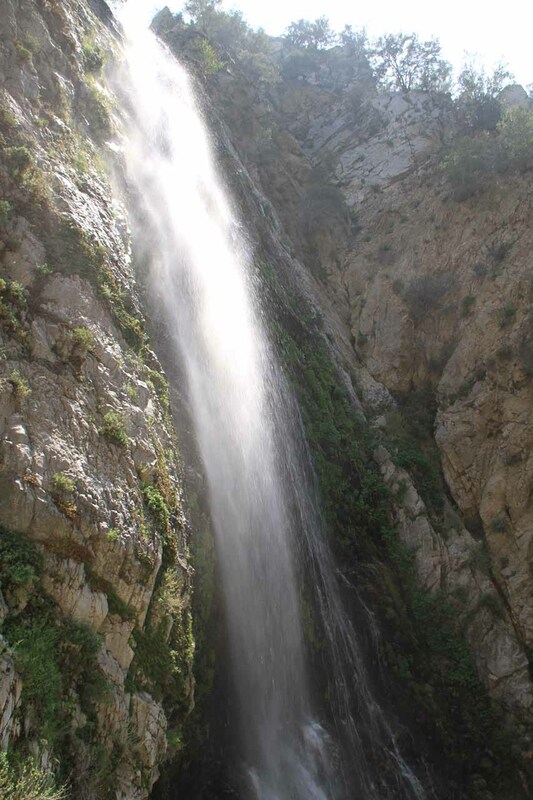 Speaking of the falls, it was one of the taller waterfalls in Southern California as it’s said to have a cumulative drop of some 400ft. 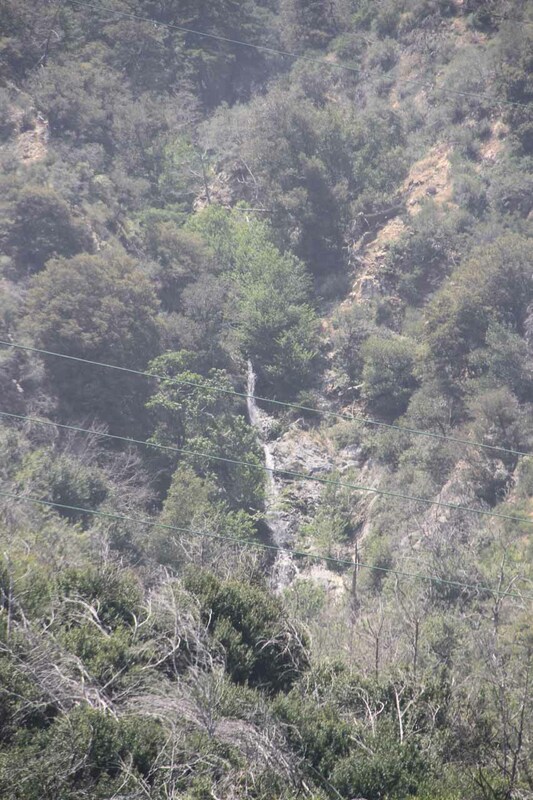 However, we were only able to see its final 90ft drop from its base (shown in the photo above) as well as a very distant view of one of its upper drops (possibly 100ft or higher) from a nearby private campground turnoff. 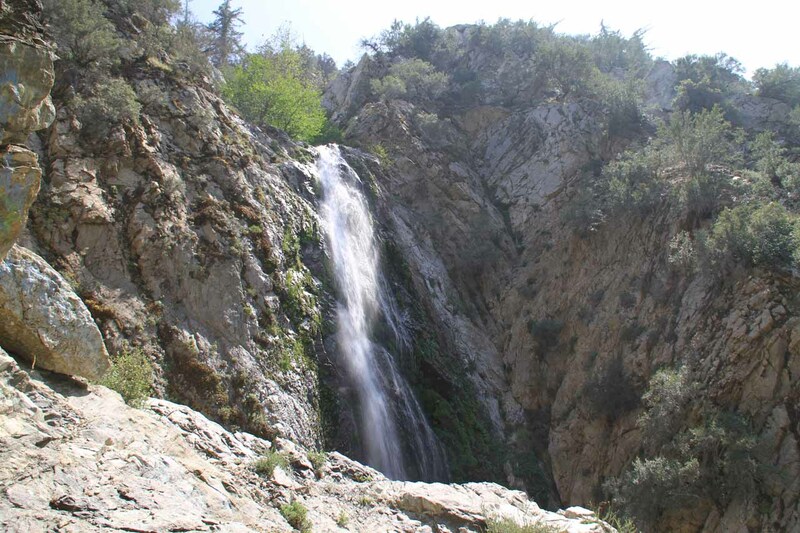 Adding to the allure of this waterfall was the adventure we had to go through involving a fording of Lytle Creek in high flow, a rough boulder scramble in a wash, and then a little bit of some rock scrambling to get right in front of the falls. 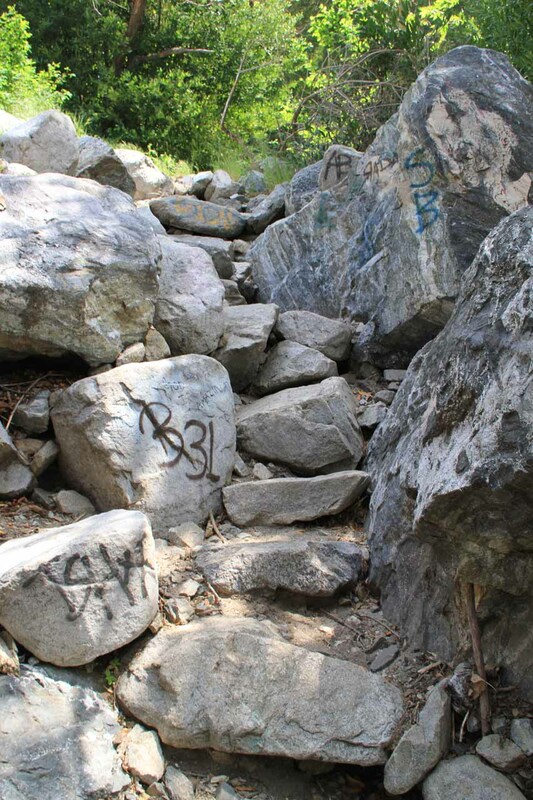 The only real bummer with this falls was the presence of insane amounts of graffiti and litter all throughout the hike (you might have guessed this already from looking at the photos on this page). 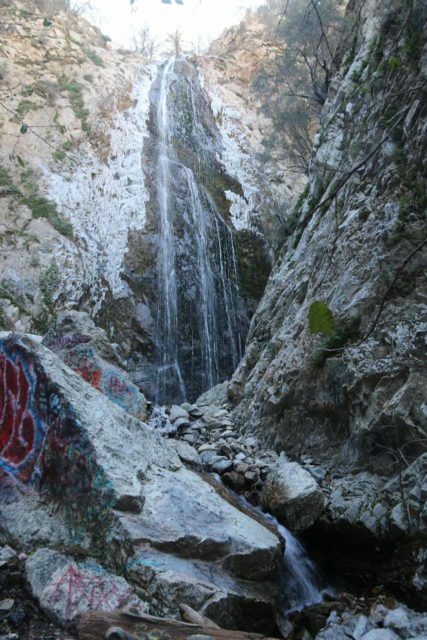 Although I’ve seen such poor displays of respect for Nature in places like Eaton Canyon Falls and Hermit Falls among others, I think this one by far took home the crown for the most trashed waterfall that we’ve been to so far in the Southland. It’s really sad that such a beautiful place like this can degenerate into something you’d expect to see in the Hood, but I guess it goes to show you how fragile Nature can be, and how easy it is to ruin a good thing when you let it. 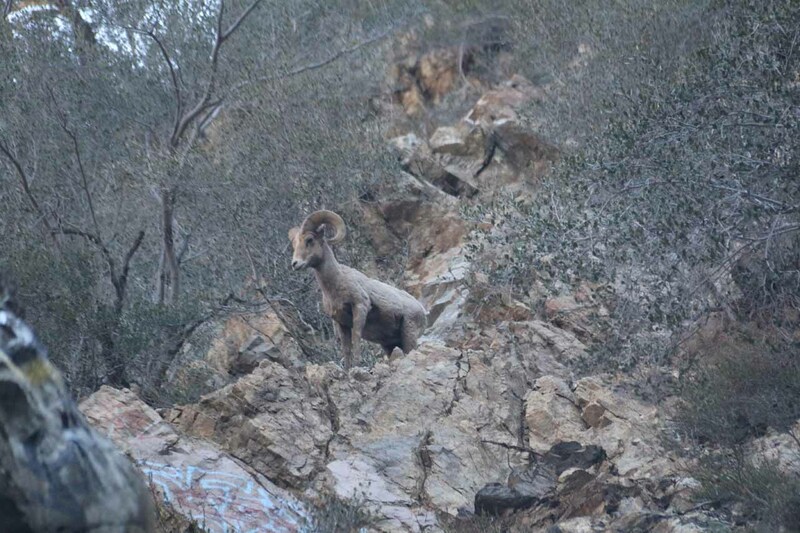 I personally hope the San Bernardino Forest Service can do something about it, but I wonder how resource-limited the National Forest Service is, especially when it’s close enough to the foothill cities like Rancho Cucamonga to allow urban blight to creep in and constantly put pressure on the resources necessary to enforce rules and clean up the mess that’s here. 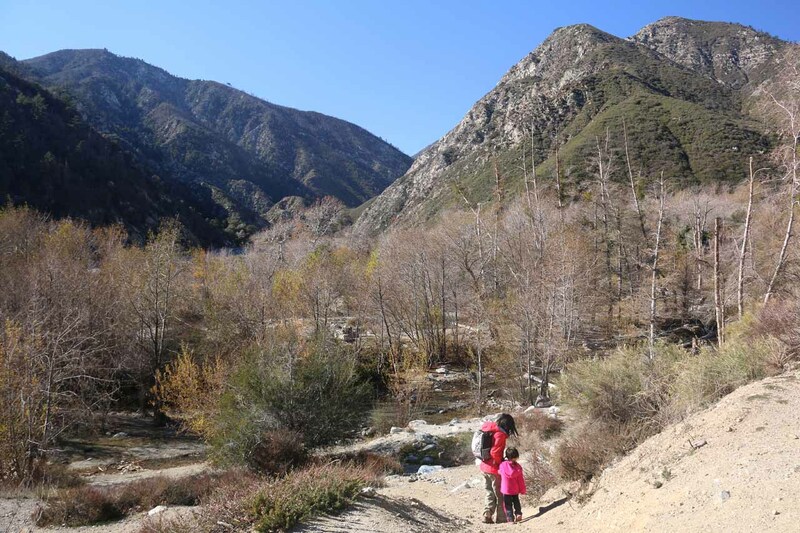 The adventure started after parking the car in one of the pullouts in the area around the confluence of Middle Fork and South Fork of Lytle Creek (see directions below). 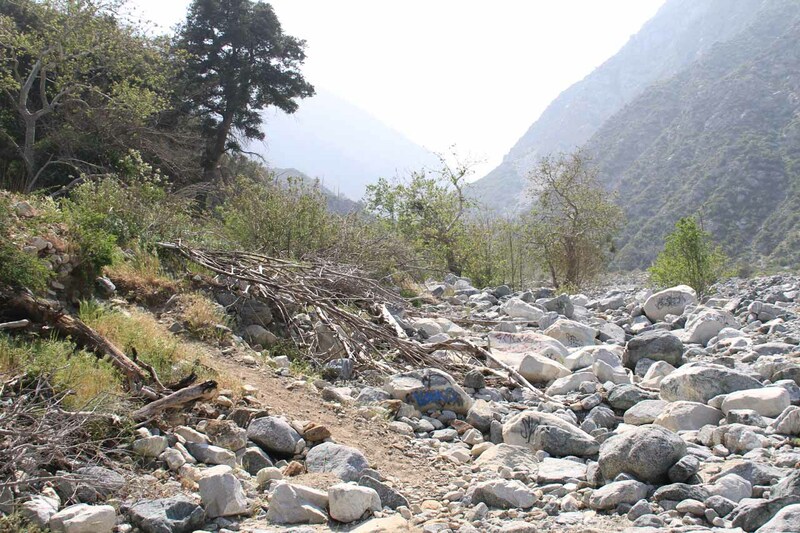 Once we got out of the car and scrambled down towards the banks of Lytle Creek, we then had to look for a place to cross that creek in order to access the wash on the other side. On my first visit here, the creek had high flow so I thought it was treacherous enough to employ river crossing techniques seen in survival shows (or at least be willing to turn back if the creek was deeper than my thighs). By river crossing techniques, I meant that I had to look for the widest part of the creek or river, unhook the waist belt of my pack, face upstream, and use a stick for added balance. 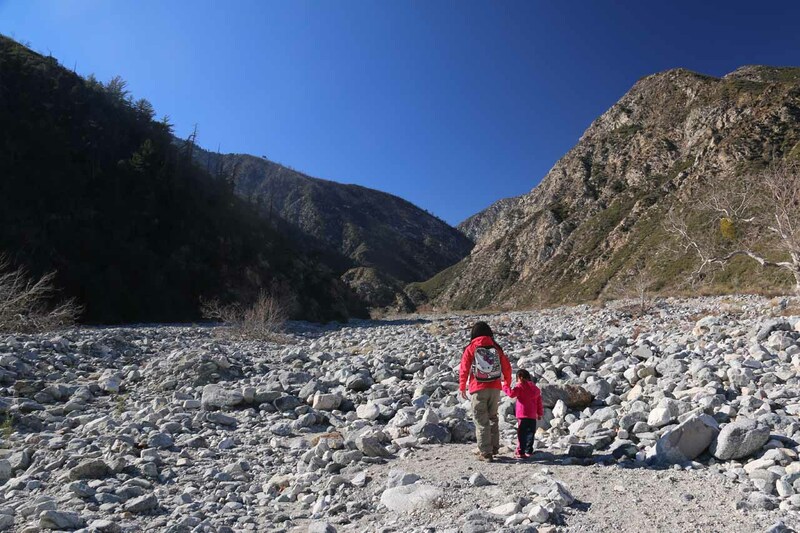 For added comfort (and to prevent ruining my hiking boots), I actually crossed Lytle Creek in Keens and then changed into hiking boots once I got past the creek crossing. 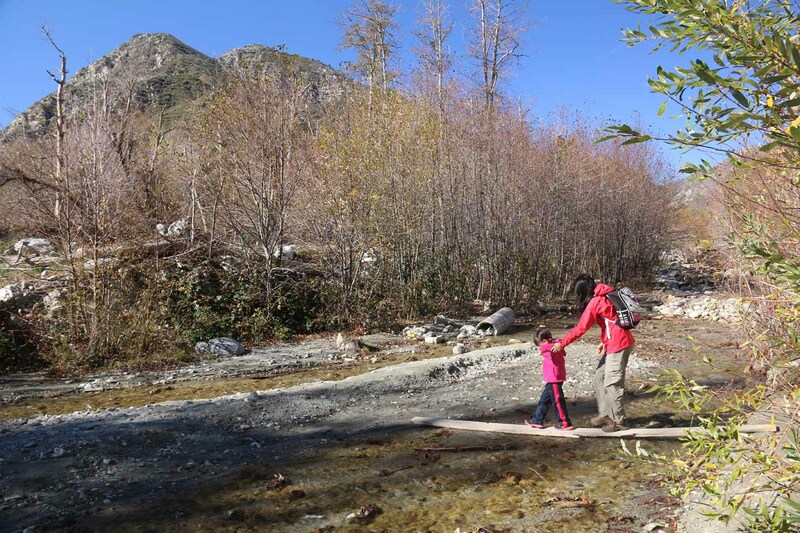 However, on a second visit four years later (in the midst of a multi-year drought throughout California), Lytle Creek was easily crossed by the whole family (with only our daughter requiring a little bit of assistance) while staying relatively dry. 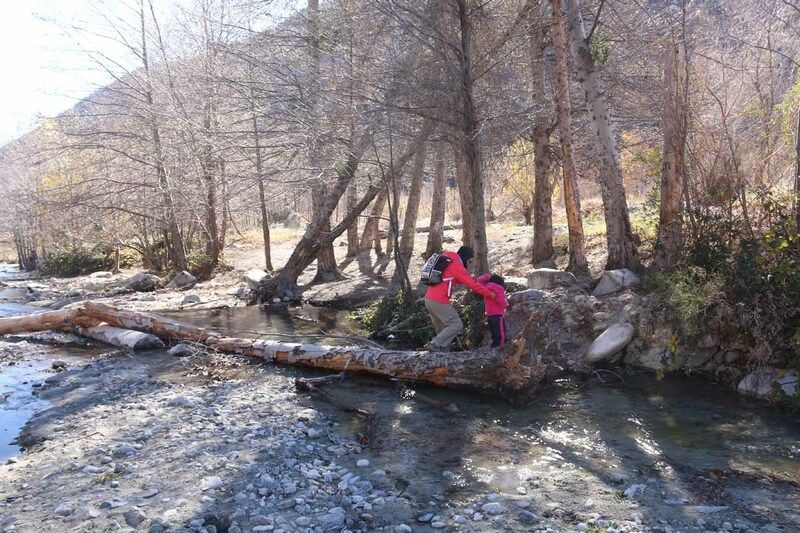 It even seemed like some folks placed fallen trees or logs (and even a plank) that traversed part of the creek to make the crossing easier. On that second visit, there was no change of shoes necessary. Anyways, the hiking boots were definitely needed because the next phase of the adventure involved walking a wide and bouldery wash. It was here that the thought of twisting an ankle did cross our minds, even though we were wearing proper footwear. 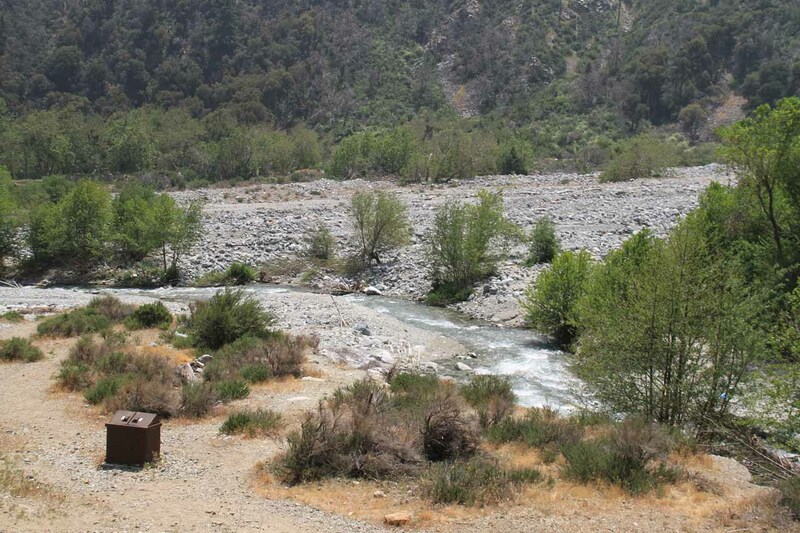 So while in the wash, we made a beeline for the south (left) wall of the South Fork of Lytle Creek. We did this because the waterfall “trail” itself lacked any signage indicating its presence, and the south wall was the nearest wall after the creek crossing, which served as sort of a trail guide for us since we knew that we had to leave the wash on this side at some point (roughly a half-mile or so from the creek crossing). Without the wall serving as our trail guide, we potentially could have missed the part of the trail that left the very wide and bouldery wash.
Of course hugging the south wall of the wash (it was mostly in shade during the Winter morning but less so in the Spring) was a bit of a mixed bag in terms of uneven footing and some moments of relief by being relatively flat. 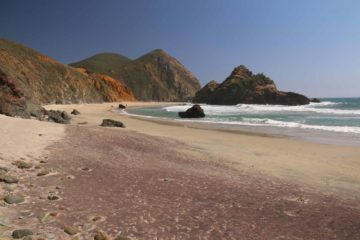 However, it turned out that there were more flatter and less rockier informal footpaths closer to the other side of the wash (closer to the campgrounds) then ultimately towards the middle of the wash. Thus, we figured that on a first visit, hugging the south wall might be the easier thing to do even though the hiking might be slower going. 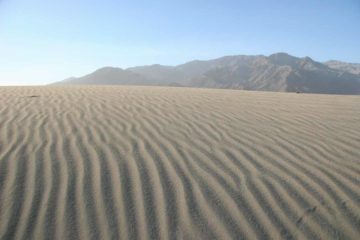 But on the return, hiking the flatter and more sun-exposed trails of use within the wash would make for a quicker exit. Anyways, once we reached the fairly easy-to-miss footpath about a half-mile from the creek crossing (there were more trees and vegetation surrounding this escape from the wash hinting at the presence of water), we then promptly climbed up some more conventional trails, which even passed by a reassuring sign a bit above the wash itself. It was too bad the sign didn’t say anything and it was covered in graffiti, but that sign kind of mentally assured us that we were on the right path to Bonita Falls. 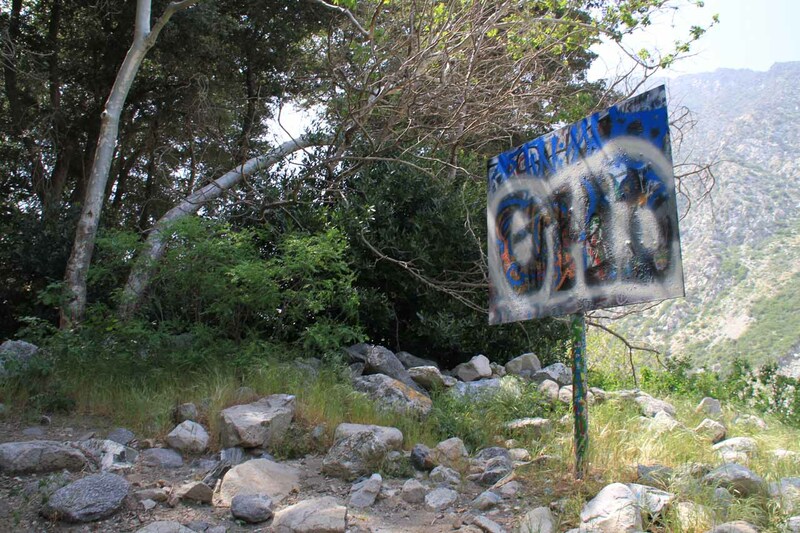 Next, we continued going uphill from that graffiti-laden sign as the trail went past more spray-painted boulders while weaving between shrubs and trees. 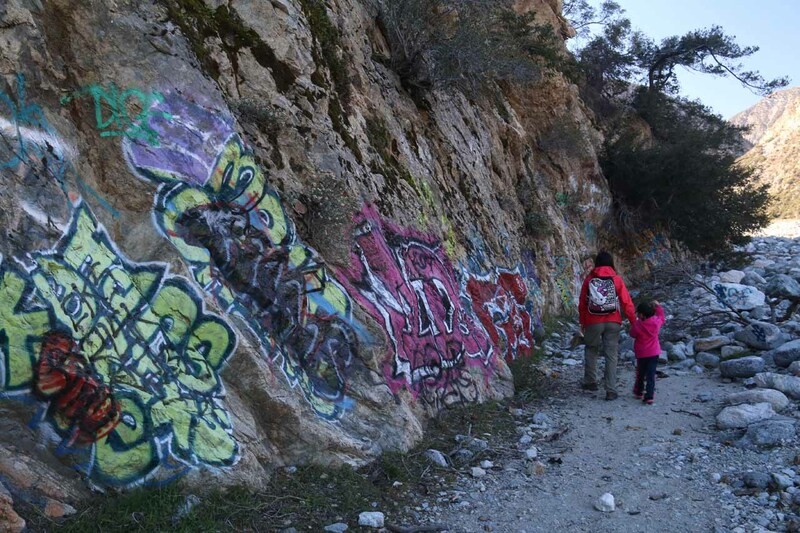 Then, we had to go up some more rocky climbs amidst more graffiti before regaining the trail of use essentially skirting alongside the creek responsible for Bonita Falls. Probably after another 10 minutes or so, we were finally up the last of the rocky climbs leading us right to the base of the waterfall. 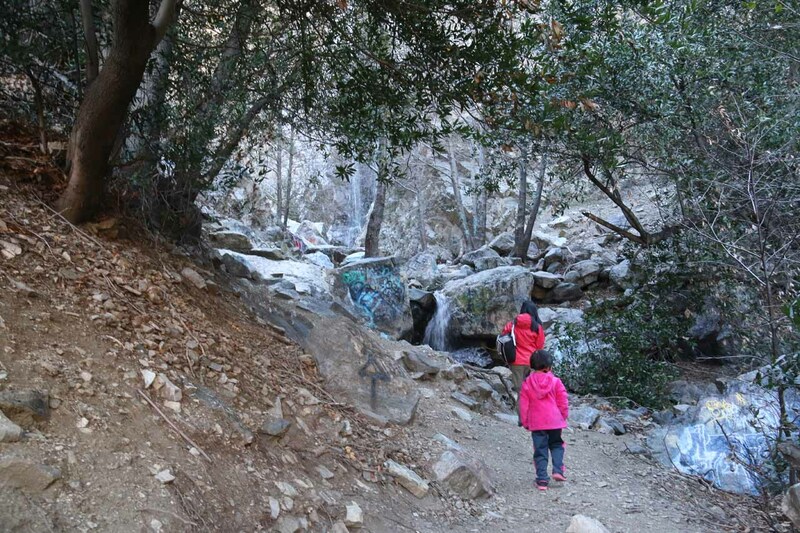 While the last 10 minutes of walking and scrambling got steeper with plenty of deadfall obstacles and slippery rocky sections, they were relatively tame enough that even our four-year-old daughter was able to do it mostly on her own with a little care and supervision. 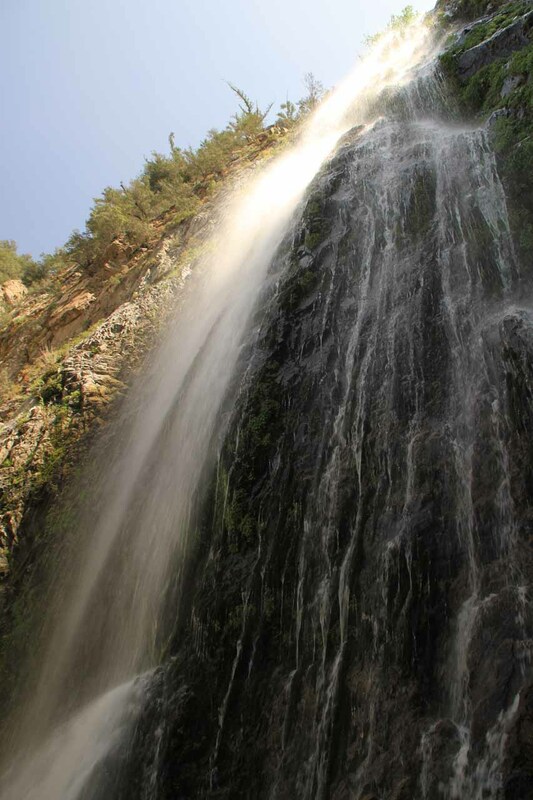 At the base of the falls, it was possible to do a little more scrambling to get right up to the pool beneath the main tall drop of the falls. 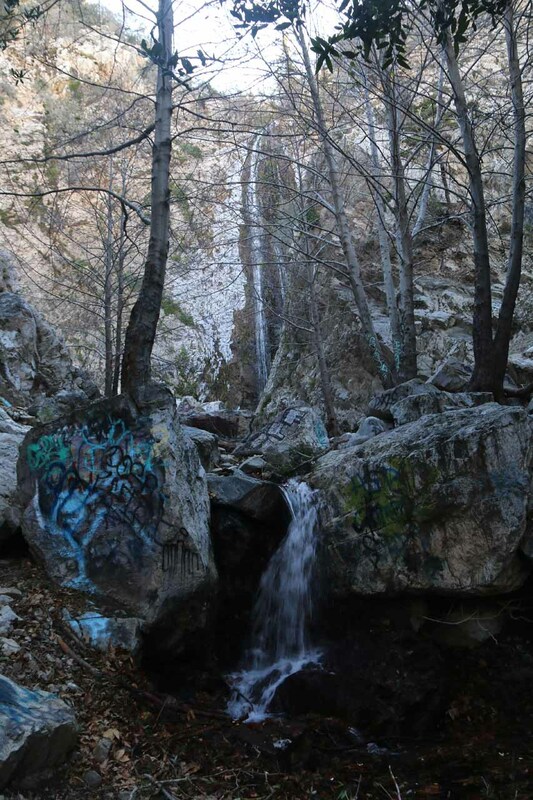 It seemed the intensity of the graffiti was maximized around the waterfall itself, which illustrated just how defiled this otherwise beautiful waterfall was. 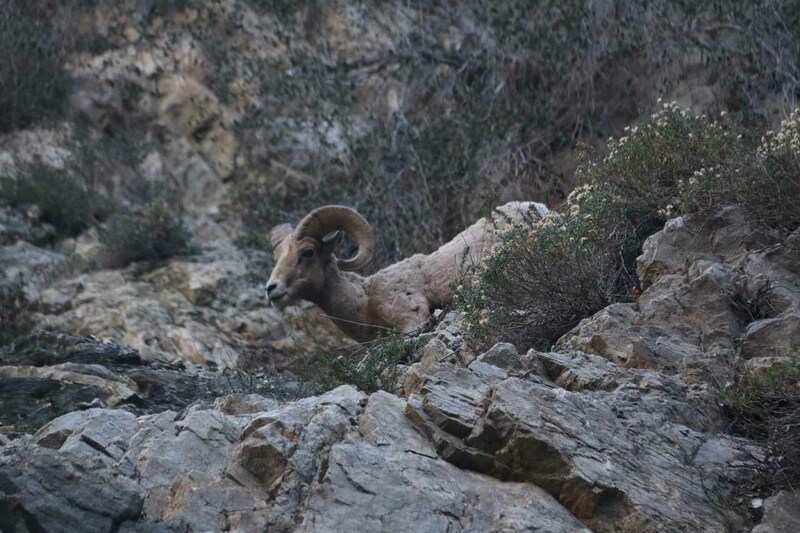 That said, this was also the place where we saw icicles spreading out from the upper reaches of the falls while bighorn sheep were grazing high up on the cliffs nearby. 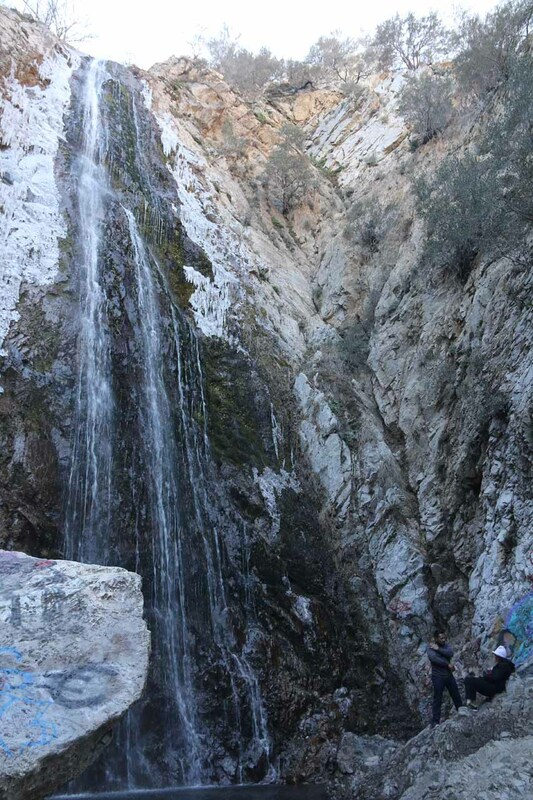 Given how steep the surrounding cliffs were, we had to be cognizant of the rockfall and icicle danger. So we stayed as far away from the cliff walls as we could, and we didn’t linger longer than we needed to. 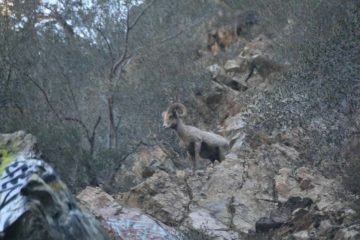 In fact, the bighorn sheep we saw were inadvertently kicking down rocks, which rapidly tumbled to the base of the falls. Getting hit by one of these rocks would definitely cause injury, and it just illustrated the inherent dangers of a place as beautiful as this. In addition to the falls (and the sheep), I also made a steep scramble up the south side of the canyon (before the final dead-end containing the waterfall itself) up to where there was a trio of tiny caves as well as the possibility of glimpsing the main waterfall rising above the foliage. 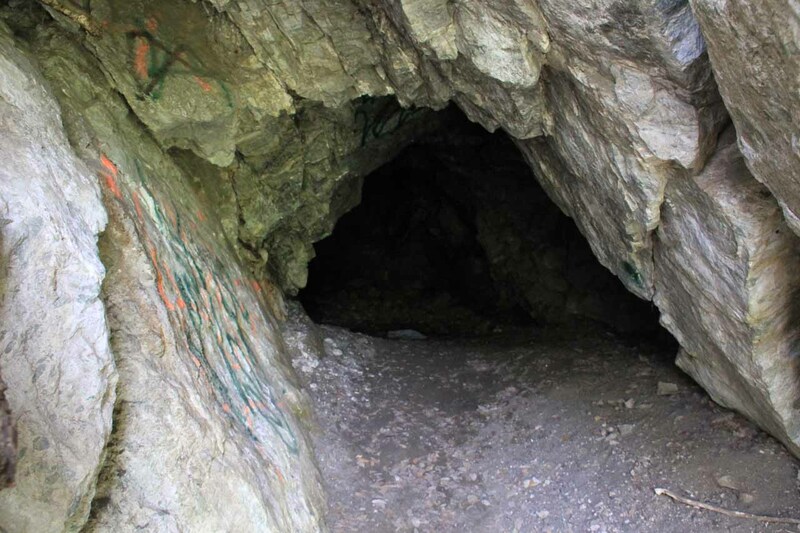 I only managed to scramble up to two of the three caves and didn’t see the upper tier during my visit. 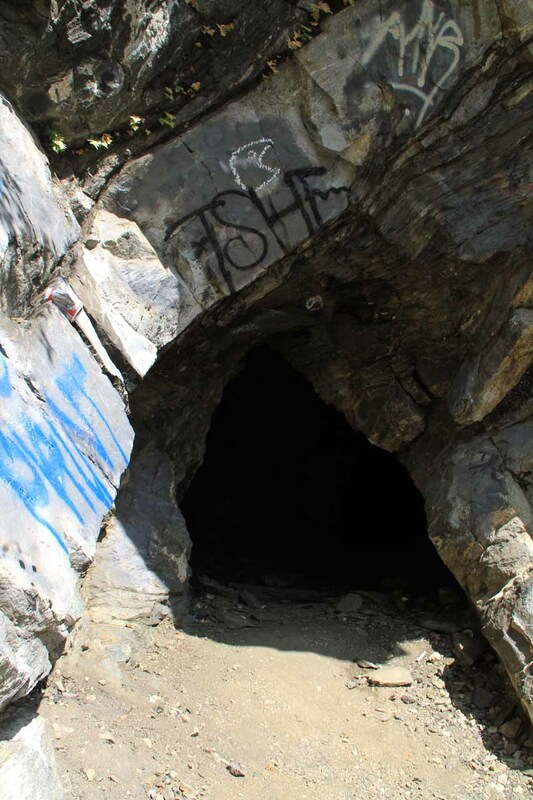 But like the rest of this side canyon, these caves were also loaded with graffiti. 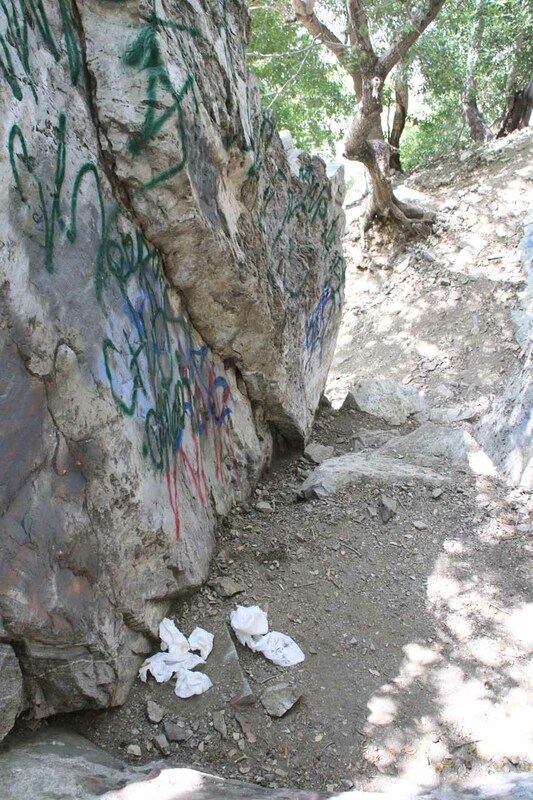 I even noticed toilet paper soiled with poop left right in front of one of the caves. All in all, it took me roughly 30 to 45 minutes in each direction to cover the roughly 1.5- to 2-mile return hike and scramble. 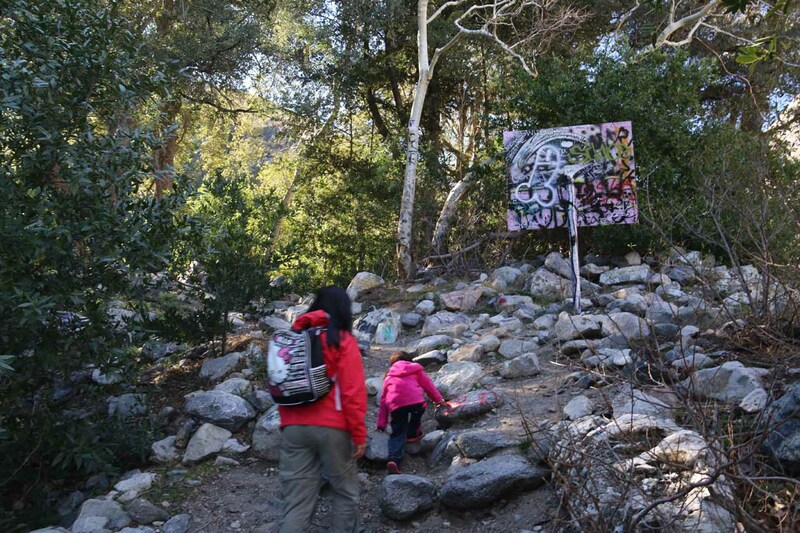 When Julie, Tahia, and I did this hike as a family, we spent roughly 2.5 hours away from the car (a bit longer than the 90 minutes I had spent when I did this hike solo four years prior). From the Los Angeles basin, you can drive east on any of the eastbound Freeways (e.g. the 10 Freeway, 60 Freeway, or the 91 Freeway) until it reaches to I-15 going north (kind of like you were going to Vegas). 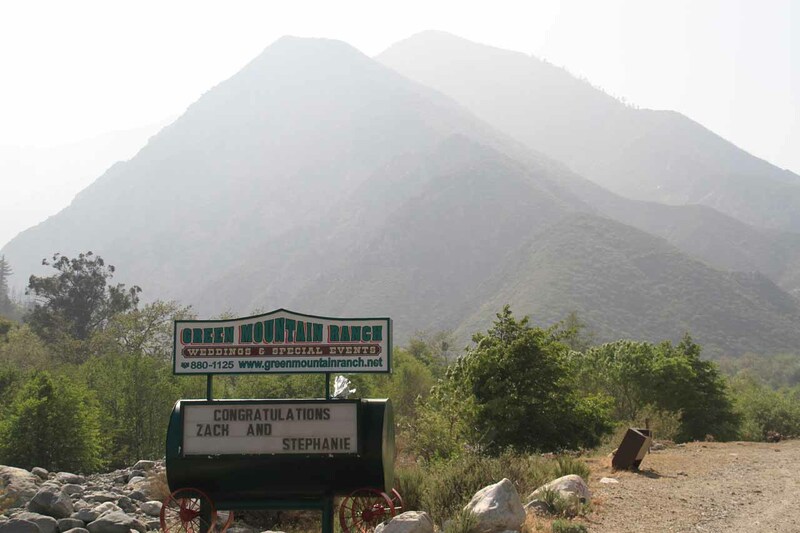 However, as you drive along the I-15 just north of the 210 freeway near Rancho Cucamonga, exit Sierra Ave then turn left to go deeper into the mountains. 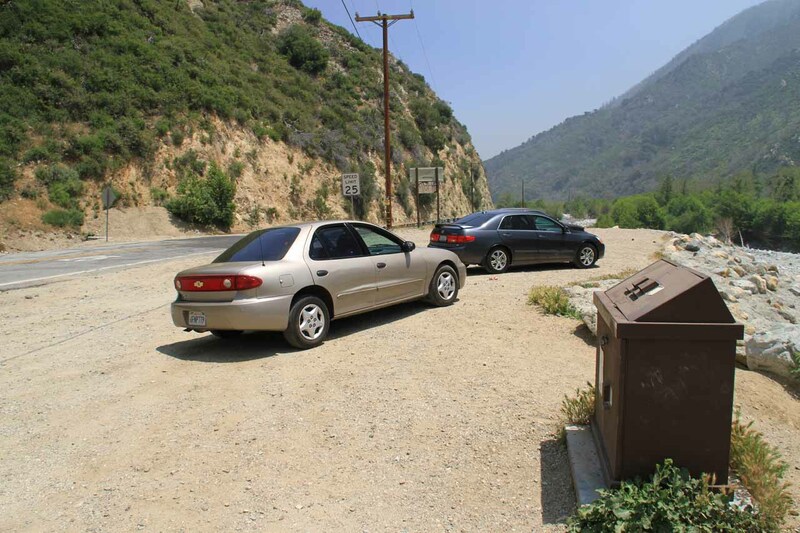 Eventually, Sierra Ave becomes Lytle Creek Road. 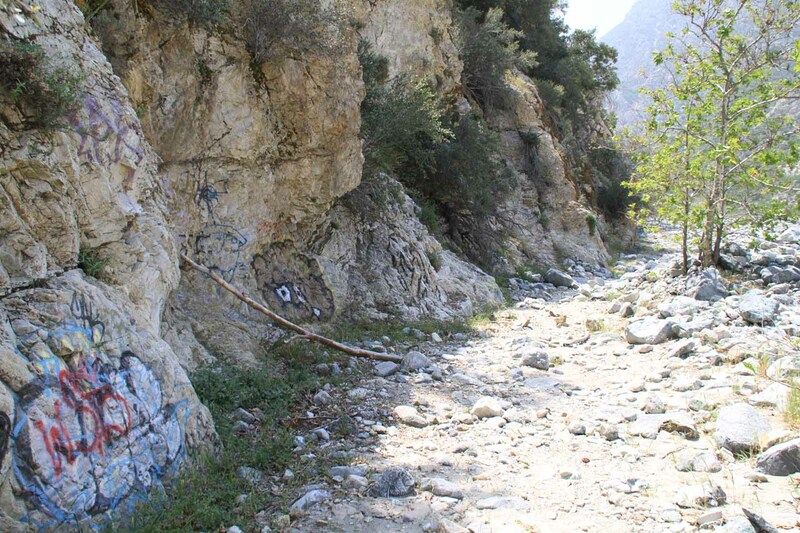 Continue taking Lytle Creek Road for a little over 6 miles from the I-15. 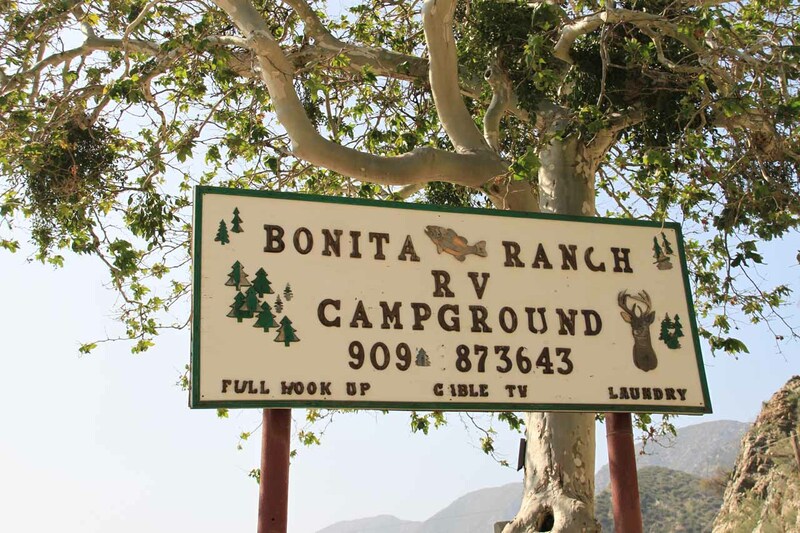 Once you’ve gone past the Lytle Creek Ranger Station (you can also buy Forest Adventure Passes here), then start looking for a pullout (not signposted) with a bear-proof trash bin between the Green Mountain Ranch sign and the Bonita Ranch RV & Campground sign. The adventure described above on this page begins from this pullout. 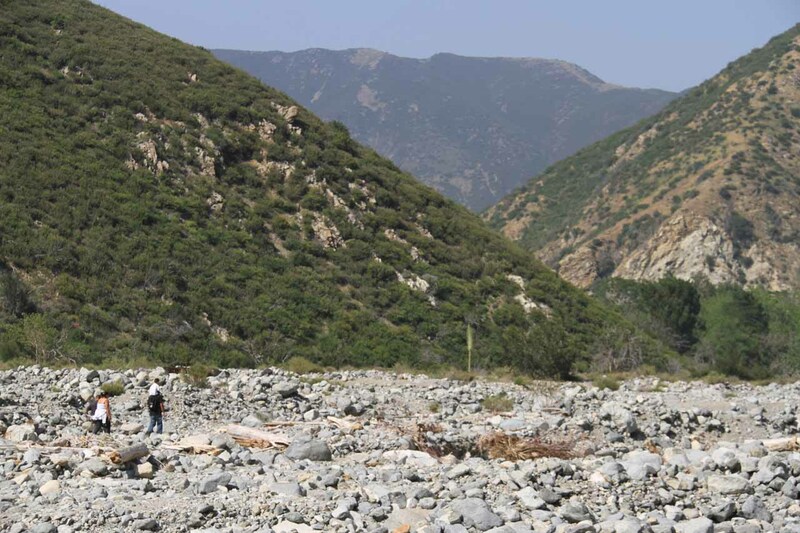 Overall, the drive from downtown LA would be about 59 miles (or roughly 90 minutes drive). 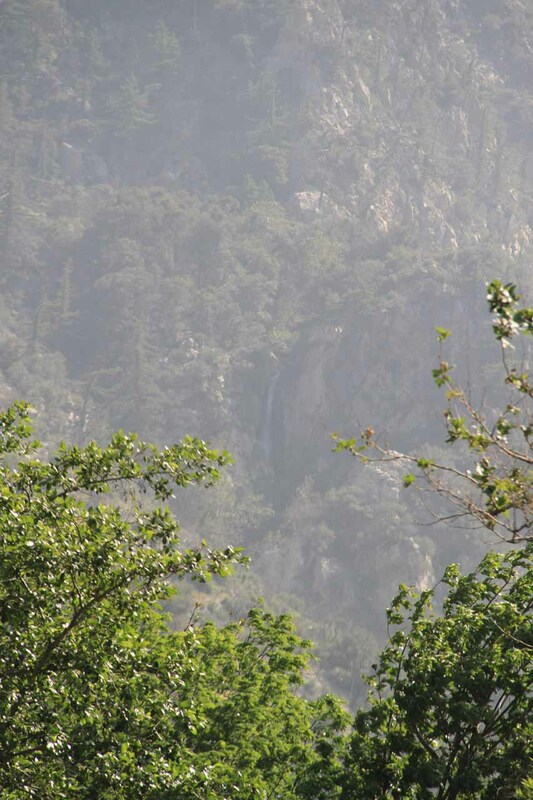 Now if you’re curious about getting a distant (but unsatisfactory) view of one of the upper tiers of the falls, you might be able to spot it once you turnoff towards the private Bonita Ranch Campground (just a short distance west of the unsigned pullout to start the hike). 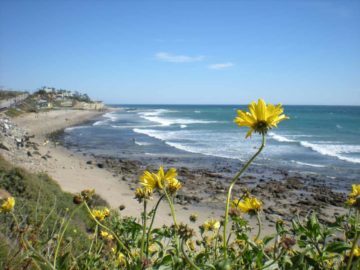 However, be cognizant that the owners and guests do not appreciate you blocking traffic in order to catch this view.